Ah, feijoada. Brazil's "national dish" if one is to really exist, it is a slow-cooked joy of black beans, pork meat and sausages. Vegetarians need not apply (oh, okay, yes, vegetarian variations do exist but I would prefer to call that something else. To me feijoada is beans and pork). My husband explains to me that there are a few ways to serve a feijoada. The first one is a feijoada "completa" which means not only do you have sausages, pork loin, dried beef and ribs, but you have your pig tail and your pig tongue and your pig ear in there. 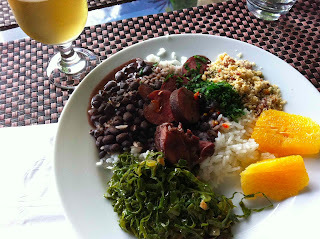 I am not a fan of the "completa" and this is why I love the feijoada served at our small club every single Saturday of the year (feijoada is traditionally served on Wednesdays and Saturdays in São Paulo). There are giant urns of bubbling beans, sausages, ribs, etc all separated--which allows me to skip over the tongue and ear options. They don't serve the pork tail at the club--must not be a success. You serve feijoada over white rice, with "farofa" --- that one is hard to translate--ummm, manioc flour fried with garlic, "couve" (kale fried up with garlic) and orange slices. You can also add fried pork rinds and spicy sauce that varies from mild to "call-the ambulance." In reality, my husband says that if you don't need to call an ambulance at the end of your pig-out (pun intended), you haven't eaten enough. Feijoada is my favorite Brazilian food. Served with a little cachaça shot and a beer that is "estupidamente gelada" (silly cold), it is Brazil's gift to the world.